(Reuters) - Canada's main stock index eked out gains on Thursday after data showed increased domestic hiring and wholesale trade, even as the U.S. Federal Reserve abandoned projections for interest rate hikes this year amid signs of an economic slowdown. * At 10:05 a.m. 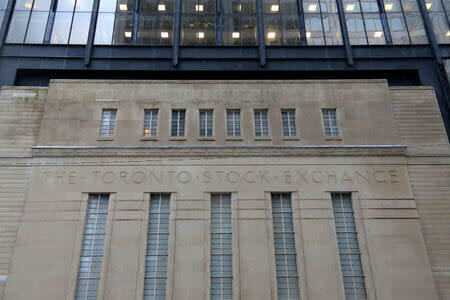 ET (1405 GMT), the Toronto Stock Exchange's S&P/TSX composite index was up 13.96 points, or 0.09 percent, at 16,181.52. * Meanwhile, Statistics Canada said wholesale trade increased by 0.6 percent in January, above a 0.5 percent rise forecast by the Reuters' survey of analysts. * Alamos Gold Inc fell 3.4 percent, the most on the TSX, as Bank of Canada downgraded the stock to "sector perform". * The second-biggest decliner was Martinrea International Inc , down 3.2 percent, as BMO moved to the sidelines on the company's stock. * The most heavily traded shares by volume were Aurora Cannabis , Green Organic Dutchman Holdings Ltd and Crescent Point Energy.